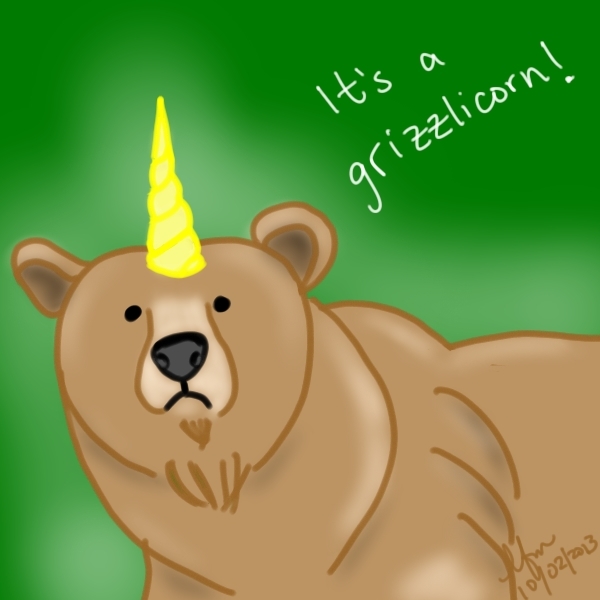 Random things: Grizzlicorn | Random moosages as I see fit. This isn’t from the list of 100 things to draw when you’re bored, in case you’re looking for it. I ended up drawing a grizzlicorn because one of my coworkers asked for it. Perhaps you are asking why would he ask for such a thing. It’s because he saw me doodling during a meeting one time but he couldn’t quite see what I was drawing. I was drawing a shark (of course). For some reason, he thought I was drawing a butterfly. And when it came out that he thought I was drawing a butterfly, he was ridiculed by our other coworkers and me. He obviously doesn’t know me terribly well. Later that day, I decided to draw him a shark with butterfly wings instead of fins. And I did so. On a post it. Which is why I didn’t post it (hehehehe) first. I have a photo of it, but I gave the post it to him so I can’t scan it. Maybe I’ll draw a shark with butterfly wings some other time and post it (hahahahaha). Now then, my coworker rather liked the shark with butterfly wings and asked if I could draw a grizzly with a unicorn horn. He thought it would be ridiculous because grizzlies are fearsome animals and it would be funny to put a unicorn horn on one of them. Little did he know that I was thinking more of a derpy grizzly as opposed to a fierce grizzly. As for the name of this thing, my coworker kept calling it a grizzly-unicorn, which I thought was unwieldy. So I shorted it to grizzlicorn, which he liked. But later, a friend pointed out to me that a grizzlicorn would be something right out of one of my favorite indie comics, Axe Cop. And then I realized that a unigrizzly would also fit in pretty well in Bearmaggedon, another one of my favorite indie comics. OMG! I NEED TO ASK IF MY COWORKER READS AXE COP AND BEARMAGGEDON! !